One of the children caught up in an attack on a school bus in Italy is being hailed by his classmates for saving everyone on board. 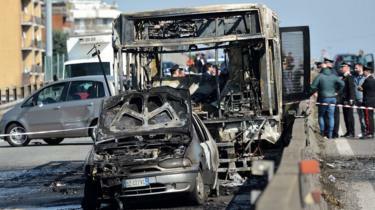 The bus driver allegedly hijacked the vehicle and its 51 schoolchildren near Milan, then set it on fire. Children interviewed by Italian media said 13-year-old Ramy Shehata hid his mobile phone when the driver confiscated them from other students. The police were then phoned. “He is our hero”, one classmate said. Italy’s Ansa news agency reports that Ramy made the call while pretending to pray in Arabic – but was in fact issuing a warning to his father. Police vehicles located the bus and forced it to a stop before the driver, during a stand-off with police, set it alight, having already doused the vehicle in petrol. Italy’s La Reppublica newspaper reports that all the hammers to break glass had been deliberately removed from the vehicle. During the hijacking, he reportedly told the captured schoolchildren he was prompted by the deaths of African migrants crossing the sea. A police spokesman also said that during the standoff, he had shouted “stop the deaths at sea, I’ll carry out a massacre”. Italy’s government has taken a hard-line stance against migration from northern Africa, curtailing search and rescue operations – which humanitarian groups say endangers lives. 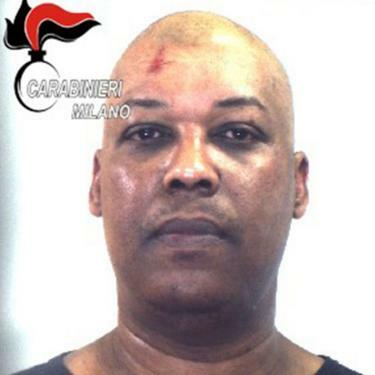 Interior Minister Matteo Salvini, a key architect of that policy, has referred to the suspect as “a Senegalese with Italian citizenship” rather than calling him an Italian. Alberto Nobili, head of counter-terrorism at the Milan public prosecutor’s offices, said the suspect had not linked himself to any banned groups or movements. He told reporters the suspect had said “it was my personal choice, I could no longer see children torn apart by sharks in the Mediterranean Sea, pregnant women dead”. Officials at Mr Salvini’s interior ministry are considering revoking his Italian citizenship. The driver was also known to have a conviction for sexual assault – which resulted in a year-long prison sentence – and a drunk driving conviction, Mr Nobili said.